I know we have a lot of readers who either need to avoid Gluten themselves or do so because kids or spouses need to. If you shop the store you do find some products, but they can be tough to find. Here’s a great way to get those products you want (and you don’t even have to leave your house). 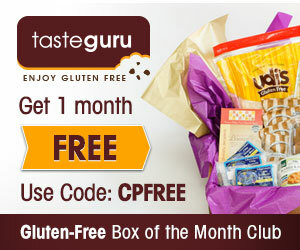 Taste Guru delivers high-quality gluten-free foods to your front door each month! Right now, you can actually try one month for just the cost of shipping — $12! Just sign up and then use the code CPFREE at checkout to get in on this offer. Your service will continue at a rate of $24.95 per month and you will receive a box filled with 5 lbs of food (this is a savings of 50% off of what you would pay retail)! Shipping is always free (after that first box) – so you can count on paying only $24.95 going forward! Sign up for Taste Guru to try your first month for free. You might discover great gluten-free products which you’d have never known about otherwise!